While I was traveling through the Northern Territory, on my last journey, I’d stopped at a roadside parking bay to camp for the night. I’d parked along side a park bench as I had some work to do on an inverter that was playing up in the van. It was dark before I had started and I had pulled most of the thing apart, found the problem and was in the process of putting it back together. I could “feel” someone (or something) watching me. Out of the corner of my eye, I noticed something move. 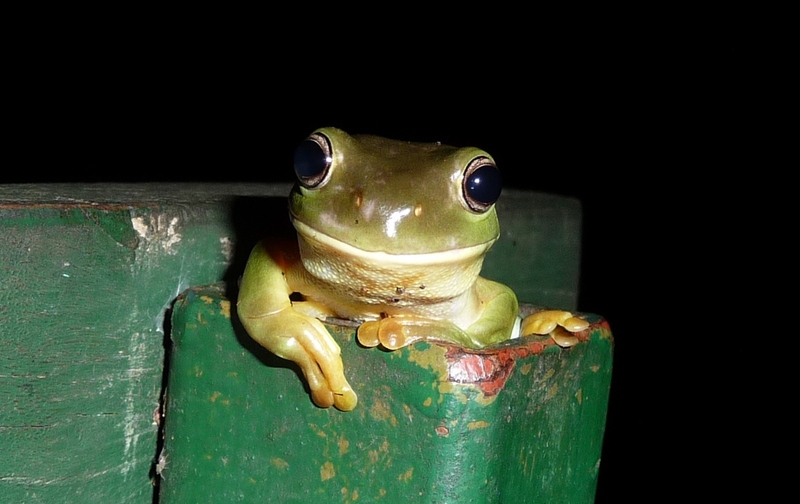 There was a green tree frog perched, half in and half out, of the post at the back of the chair. He was just sitting there watching me with his huge, inquisitive, dark eyes. I had to take a photo (pictured) and I’m sure he posed for it! I started to explain, to the frog, what I was doing. I must have got him interested because he jumped out of the post and onto the table. I’m not kidding, It was like he was really interested in what I was doing as well as listening to everything I said. ( I wasn’t blind drunk or tripping either). The next thing he did freaked me out completely… He jumped on my arm, walked up to my shoulder and the jumped onto the top of my head!!!! He remained perched up there for about ten minutes or so before returning to the table. I finished up what I was doing while he made his way back to the hollow post. He disappeared down the hole while I retired to bed. It was truly an amazing experience!!! The Crypt was a nightclub in Salisbury I went to every Thursday, Friday, Saturday and Sunday night. I was about 18 I think and I got pretty messy nearly every night I went. I remember when I’d get too drunk, I’d go upstairs to the toilet and have a sleep for a bit to sober up, head back downstairs and top back up. On one particular night I got extremely drunk and decided to drive home, to my unit, which was just around the corner. I can’t remember getting in the car but I remember turning the corner out the front of the disco and next second a parked car jumped straight out in front of me!!!! My car was a right off but I managed to put the hazard lights on before I took off… who says I’m not a responsible drunk!!!!! I went back to the disco and phoned my dad. It must have been about 1.00 in the morning and this was pre mobile phone days. Dad, who is also a heavy drinker, must have sympathised with me and came and picked me up. As we were turning the corner to go back to his place, the cops were all over the crash site. I didn’t contact the police until the next day and explained that I had no idea what had happened, I had just “came to” while walking in the middle of the road not far from my dads place. I must have blacked out after the accident….. they bought it!!! I got away with my second drunken right off.